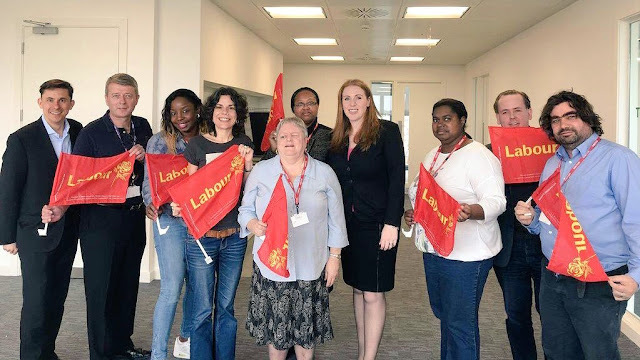 Picture from last weeks UNISON Greater London region "Labour Link" Political committee AGM. I was pleased to be re-elected as Chair for the next 2 years. Our first speaker was Joanne McCartney AM, who gave a London Assembly report on the latest attempts to hold lazy posh boy Tory Mayor, Boris Johnson, to account and what the Labour candidate to replace him, Sadiq Khan, will do to improve our Housing, Transport and Policing. Re-elected Committee member, Mike Katz, is also standing for election to the GLA as a list Assembly member. He pointed out that TFL management are finally admitting that Sadiq plans for transport are affordable and will save money. I was really pleased to introduce our keynote speaker, Shadow Pension Minister, Angela Rayner MP. Angela is a former UNISON branch secretary and Regional convenor who was elected last year to represent Ashton-under-Lyne. She rapidly became a junior whip then in the last reshuffle, the Shadow Pension minister. I have been privileged to know Angela and her fellow UNISON activist husband Mark for a number of years. At UNISON conferences over the years I have enjoyed seeing them and their lovely children. Angela spoke about being a home carer and 16 year old single mum without any qualifications. She was written off by many but thanks in part to her union she was able to become one of the very few former manual workers to become an MP in the last election. She described how difficult it was at first and the lack of support that new MPs get and the attacks against her by the right wing media. She was told by an old hand MP that she should see these attacks as a compliment since they are only attacking her since she being effective. Angela is bright, super capable and driven but she is also a great example of how UNISON can help grow its activists and I am super proud of her and can't wait for her to be a Pension Minister in government ASAP.